Recently we broke ground on our newest Matablog feature Get To Know Your Local Independent Retailer with L.A. vinyl gurus Origami Vinyl. 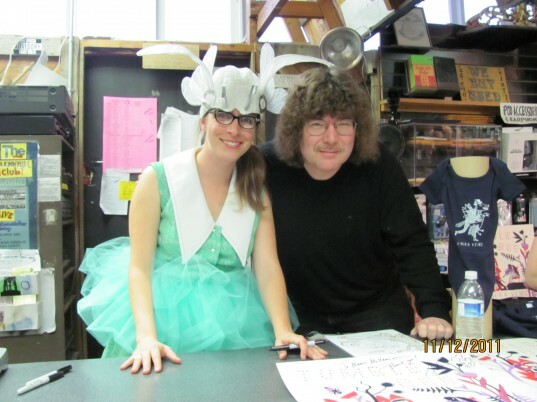 This week, we travel up the Pacific Coast to Portland for a chat with Terry Currier (pictured below, on the right), owner of Rose City institution Music Millennium. Music Millennium opened on march 15th, 1969. It grew to a full catalog store. Music Millennium pioneered live music in a record store putting in stage on our 10th Anniversersary with a permanent sound system. We do about 150 live performances a year. I started in record retail in 1972. I did not grow up listening to the radio or recorded music. I played clarinet and was going to go to college on music scholarships. I got a car at 16 1/2 after riding a motorcycle in the rain and snow for the first six months of my 16th year. The radio got me interested in music and 2 weeks before my senior year of high school, I went to my first concert – Leon Russell & The Shelter People. Two weeks later I applied for a job in a record store and they hired me on my enthusiasm and didn’t ask me what I knew about music or I would have not got the job. 3 weeks later my girlfriend (met at the store) told me she had a surprise for me that night. It turned out to be a trip to Music Millennium. I went there almost every night after work in my record store job reading album covers back to back, specially their import section. 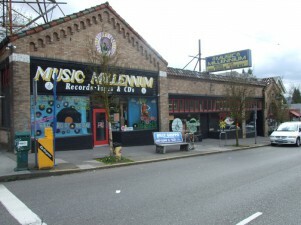 In 1984, after the middle ownership at Music Millennium was going to file bankruptcy, I went to work for the original owner as he assumed the debt and the inventory and building. I bought pieces of of it and eventually bought the whole thing. I paid it off around the dawn of downloading. I have so many favorites but Twist & Shout in Denver and Waterloo in Austin have pretty amazing stores. Fingerprints‘ new store in Long Beach is really incredible. I always gravitate towards the vinyl section of any store i get to visit. The past decade has been very trying, especially the past couple years. The economy really has been a factor in slowing business the past couple years. It’s sad to see stores like Ear-X-Tacy go from being one of the best record stores in the country to having to close. Anyone still doing it is doing it for the right reason – the passion of the music. That is why they are still open. Many indie labels have succeeded in these times and had much success though. I still feel that physical goods are viable and the market could increase with a unified effort. Vinyl is a bright spot as new consumers get into it everyday. Had vinyl stayed around instead of the CD in the late 80’s, the industry would have not been effected as much by digital. Everything about vinyl is great; the sound, the covers, the jackets. We pinch ourselves every once in a while over the instores we have hosted. Joe Strummer, Randy Newman, Soundgarden, Steve Earle, Paul Westerberg, Sleater-Kinney and Keith Emerson! Record stores use to be community centers. Many still are but to a lesser extent. When you go to a good record store, you are going to get turned on to music you did not even know existed. You browse on the internet, you read magazines, but record store employees that you connect with can make your day. Browsing in a good store you will discover so many things. And for shopping vinyl, especially used, you have a chance to find those coveted pieces you have been looking for for years or just a fun piece like a “How To Bowl” record or “Music For Your Plants’ record. Sure, you can search online but takes the fun out it. Shrimp. With a real good and flavorful hot sauce. You don’t want to hide the flavor of the shrimp, you want to enhance it. My favorite albums of 2011 are Unfazed by Delorean and Sky Full of Holes by Fountains of Wayne. You can’t go wrong with the new album Viva Voce The Future Will Destroy Us. If i had to name my favorite bands of all-time – The Kinks, Spirit and Mott The Hoople. The favorite thing about the store is the feel. The store has character. It still has the feel it did 40 years ago. We have tried to preserve that as we have made changes over the years. You can feel the passion of the music as you walk through the store. 11. What are your goals for the future of your store? The goal is be able to continue to be a great full catalog store. I happened across the first four Blues Explosion albums on vinyl at MM late last year– two one week and the other two the next week. I was pretty happy with those finds! A great record store in a city full of good ones. I only buy my music from 2 places, directly from the bands at their shows or their websites, or at Music Millenniuem, Thanks Terry for keeping it around for us to enjoy and learn something we didn’t know we didn’t know! I always give Music Millennium first crack at my Amazon Wish list. Unfortunately (for my bank account) they usually come through! Keep it going strong, Terry! It has been an honor and an extreme pleasure to still be employed for almost 17 years at the best store in the world. Thanks to Terry Currier and the fine people of Portland Oregon. Keep it weird.